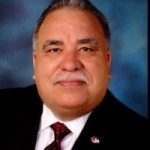 Peter Garza is the Marketing/Political Field Representative with the Northern California Carpenters Regional Council (NCCRC). His primary responsibility is for the City & County of San Francisco but extends to all of Northern California. Peter has over 13 years as a journeyman carpenter, including 6 years as a Field Representative with the NCCRC. Peter brings vast experience in management & communication, having worked in the Silicon Valley and internationally for large electronic manufactures as Regional, National & International Marketing Sales manager. Peter presently resides in Hayward, CA with his wife Maureen, a 34-year member of the ILWU. They have two grown children.